Roll out the red carpet, it’s the official premiere of the Boston Tree Party film! In conjunction with Artists in Context and the Gastronomy program at Boston University, we’re hosting a film screening of the new Boston Tree Party documentary and a panel discussion about the intersection of urban agriculture, civic engagement, and public art. For more information, please visit artistsincontext.org. We hope to see you there! Interview with Joan Pasquale, Executive Director of The Parents and Community Build Group, Inc. and The Ringer Park Partnership Group – an official Boston Tree Party Delegation in Allston, MA. 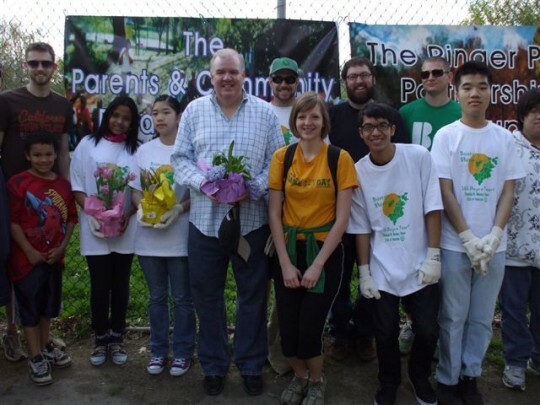 The Parents and Community Build Group is an all-volunteer, non-profit organization focused on community service. They aim to engage Boston residents through educational events and green space advocacy. The Ringer Park Partnership Group works together with the Boston Parks and Recreation Department to care for Ringer Park in Allston, MA. Why did you decide to join the Boston Tree Party? What does Civic Fruit mean to you? On April 30, 2011, we planted both apple trees during our Annual Spring Clean-Up of Ringer Park in Allston, which takes place in conjunction with Boston Shines. Over 100 volunteers joined us in celebrating the initiation of the Allston Community Orchard. The apple trees were planted on the West End House Boys & Girls Club property, bordering Ringer Park and enhancing our Greenspace Stewardship Partnership with the children at the Boys & Girls Club, who will assist us with the ongoing care and maintenance of our community orchard. Our tree party guests enjoyed a multitude of refreshments, including donuts, pastries, apples, and a pizza luncheon to celebrate both the Ringer Park Clean-Up and our historic Allston Community Orchard Tree Planting. New posters + Volunteer opportunities! Thanks to the wonderful Shea Cadrin, we now have a new poster to help us recruit our 2012 Tree Planting Delegations! Isn’t it beautiful? We just printed off 250 of these posters, and we need your help flyering this town like nobody’s business. We’re asking volunteers to hang at least 10 posters each throughout their community (coffee shops, church bulletin boards, grocery stores, you name it). The goal is to have posters in as many different neighborhoods as possible across Greater Boston. This means that the neighborhoods where you work, live, go to school, or work-out at the gym, are all wonderful opportunities to support the Party with a poster. Having only 3 staff members in Boston, we could really use your help to spread the message about planting apple trees with us this spring! Sign-up online to volunteer. Larry, our Volunteer Manager, will be in touch with details and will provide you with posters, once you have confirmed your volunteer spot online. 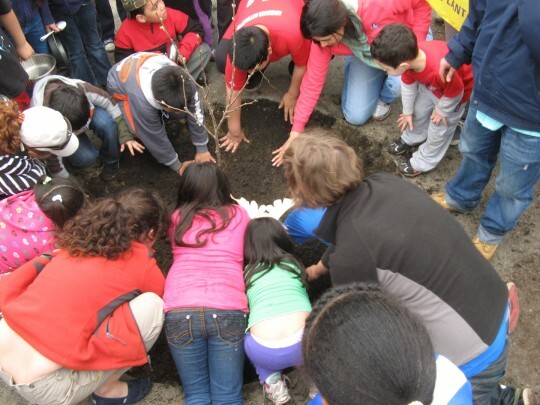 Sign-up to join the Party and become a Tree Planting Delegation this Spring! Believe it or not, spring is just around the corner…and you know what that means, right? It’s the perfect time to plant apple trees and join the Party! Last spring, we planted 70 heirloom apple trees with over fifty communities and organizations across Greater Boston. These dynamic communities, or Tree Planting Delegations, ranged from elementary schools to assisted living centers, universities to churches, libraries to hospitals, and more. 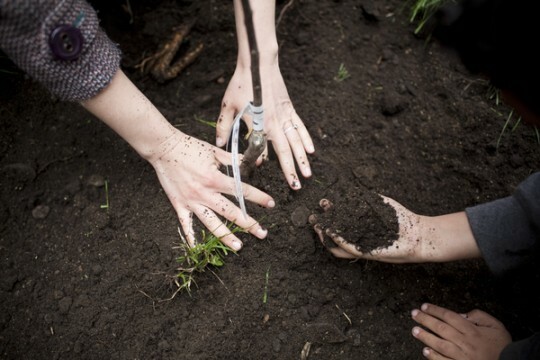 Registration is now open for our 2012 spring planting campaign! Learn more about how to become a Delegation, and please pass on this information to your school, church, library, or even dentist. Let’s grow the Party and make Boston a city of apples again! If you have any questions about becoming a Delegation, please contact Amory, and she’ll be happy to clarify the process. Think Boston would benefit from more healthy food grown right here in the city? Boston Mayor Thomas Menino agrees, and he has begun a new project with the Boston Redevelopment Authority (BRA) to update the Boston Zoning Code to allow for agriculture throughout the city. Their goal is to adjust the legal code to make it easier for local residents to grow and sell fresh, healthy, local foods in Boston. On Monday January 30th, the city held a Kickoff & Visioning Meeting at Suffolk University for this project, and Beth and Maura were there to represent The Boston Tree Party. The highlight of the night was the keynote address given by Will Allen, Founder and CEO of Growing Power Inc., an international non-profit based in Milwaukee, WI that works to address social justice and food access issues through a thriving farm-based business model. Mr. Allen won the 2008 McArthur Foundation “Genius” Grant for his work on urban farming and sustainable food production. He shared with the audience a wealth of inspiring information about how he turned Growing Power from an underutilized 2-acre lot to a farm that produces enough produce, eggs, honey, fish and other meats to feed upwards of 10,000 local residents. Mr. Allen’s main message, however, was that the good food movement truly “starts with everybody working together” because food “is the one thing we have in common.” His take-away was truly that this is an inclusive movement that affects everyone, and we should all do our part. At the end of the evening, attendees were given the opportunity to discuss what was most important to the residents of Boston. The overwhelming message was that Boston residents want chickens! But many people also mentioned the need to be creative about working agriculture into the city in unconventional ways, and also the need for ongoing support for education and supplies. At the Boston Tree Party we are proud that we’re doing our part to spread awareness that growing fresh, healthy food in the city does not always have to mean farms or even gardens. Every young apple tree counts in improving the health of the city. For more information, check out the BRA’s website to learn more about the Boston Urban Agriculture Rezoning Project. ‘Greenward’ closed: The search is on for new local retail partners! Last year, we had a wonderful partnership with a small, local business in Cambridge, MA called Greenward. They sold our t-shirts, onesies, and buttons, even displaying them in their street-side store front (as seen in the photo above). Alas, their doors have closed for business, and we are on the lookout for new retail partners to sell our Boston Tree Party merchandise. We’re looking to partner with local businesses, especially shops who engage in eco-friendly practices. 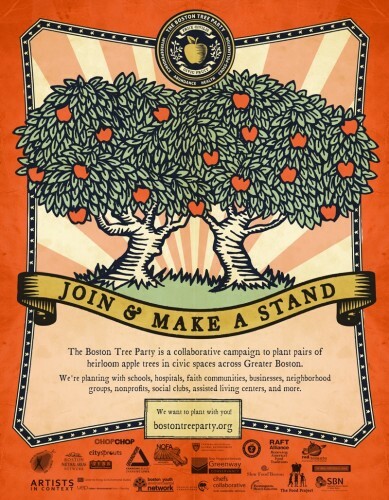 Each t-shirt we sell helps keep the Boston Tree Party running and increases visibility and awareness for Civic Fruit! We would like to work with at least five local businesses, enabling us to display Boston Tree Party merchandise in various neighborhoods across Greater Boston. If you have any suggestions or connections, please let us know!